Are you looking for a way to help young Alaskans grow up at a healthy weight? One of the best ways to focus your efforts is helping your school district pass and implement a strong school wellness policy. Evidence of the importance of a strong school wellness policy (also known as a student nutrition and physical activity policy) is so clear that the federal government has mandated that every school district receiving funds for school breakfast or lunch have one. Alaska school surveys indicate that policy works. A clear example can be seen regarding chocolate candy, other candy and salty snacks in schools. The School Health Profiles Survey is conducted every other year in Alaska secondary schools. Survey responses from public school principals show encouraging progress in the availability of junk foods in Alaska schools and a clear relationship between a school’s nutrition policy and which foods are actually sold to children. 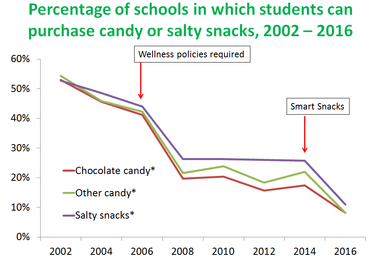 As shown in the graph below, a major decline in the availability of junk food in Alaska schools occurred in 2008, directly following a federal requirement that all schools pass a wellness policy addressing student nutrition and physical activity. The percentages of schools selling candy, chocolate, and salty snacks were all cut in half compared to the 2002 levels. What happened next really supports the argument that policy makes a difference. Rather than a constant decrease in junk food availability, declines leveled off for a couple of years — until new regulations were released. 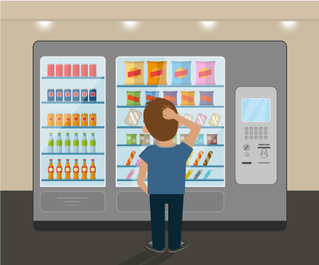 In 2014, Smart Snacks nutrition standards began to specifically require that “competitive foods” — snacks and beverages sold in vending machines, school stores, snack carts, á la carte lines and fundraising efforts during the school day — are nutritious and promote health. The graph shows that immediately afterward, there was a second big drop in junk food availability. The percentages of schools selling all three types of junk foods were cut in half again, compared to their 2008 levels. 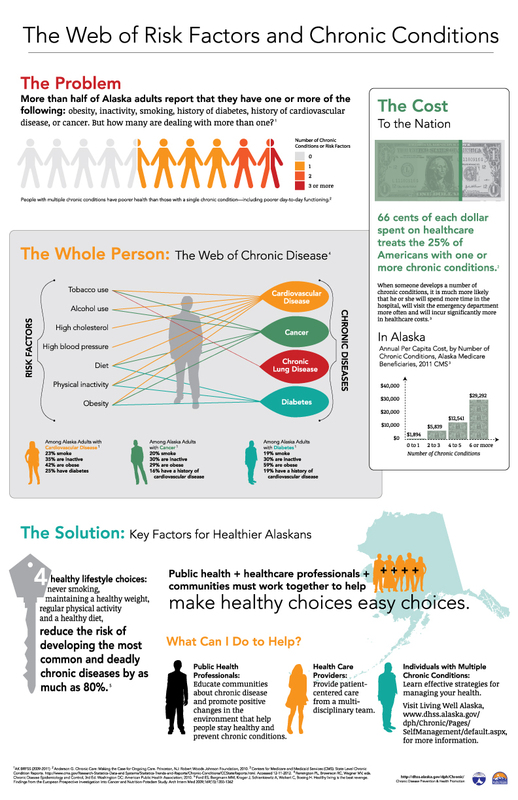 Wellness Policies aren’t sitting on shelves in Alaska. Today, less than 11% of Alaska’s schools sell chocolate candy, other candies, or salty snacks. While most districts have a school wellness policy in place, and there are some great success stories of Alaska districts putting their policies into action, the summer of 2016 brought both state and federal regulations that mean most Alaska districts need to update their wellness policies this year. A new Alaska law called “Mandatory Physical Activity in Schools” was signed into law in July 2016 and went into effect October 16, 2016. All students in grades K-8 in Alaska schools must be provided opportunities for nearly an hour of physical activity during each full school day. The U.S. Department of Agriculture (USDA) published a final rule on wellness policy implementation in July 2016. Now federal regulations don’t just require schools to have a wellness policy on the books; they require districts to report on implementation, and to involve the community in developing and updating these policies. Schools must be in compliance with all USDA local wellness policy regulations by June 30, 2017. You can get involved in your district. Alaska’s Obesity Prevention and Control Program, in concert with the Alaska Department of Education & Early Development Child Nutrition Program, has developed a Gold Standard School Wellness policy that meets all state and federal requirements. Check out this flyer for some actionable steps to promote strong wellness policies and Be a School Wellness Champion. For more information about school wellness policies, contact Lauren Kelsey, Obesity Prevention School Partnership Coordinator, at lauren.kelsey@alaska.gov.